Moringa brings back fond memories of childhood and my maternal grandmother. She had a moringa tree in her house compound where we would pluck the leaves and she would make a vegetable out of it. She would ensure that we eat this vegetable at least once a week. I did not understand the importance of it until I became a dietician. This makes me believe that our grandmother was always right and knew more about nutrition without even studying the subject. Moringaoleifera, also known as drumsticks tree, is now considered a superfood because of the myriad health benefits it has to offer. It is an edible plant where its roots, bark, leaves, flowers, fruits, and seed offer a wide variety of nutritional and medicinal benefits. The dried powder from the leaves has the most nutritional benefits to offer. Let’s have a look at the health benefits of Moringa or drumsticks. Boosts immunity, reduces inflammation and provides antimicrobial effects: Moringa exhibits powerful anti-inflammatory, tissue protective and anti-oxidant properties which help in the prevention of disease. It is a rich source of potent antioxidants such as vitamin C, kaempferol, caffeoylquinic acid, zeatin, quercetin, rutin, chlorogenic acid, and beta-sitosterol which help boosts immunity and reduce inflammation. Moringa seeds and root possess antimicrobial activity and inhibit the activity of pathogens. Helps control blood glucose levels: Moringa leaves contains a type of acid called chlorogenic acid, which has shown to control blood glucose levels by allowing cells to take up or release glucose as needed. Hence it is beneficial to people with pre-diabetes and diabetes. 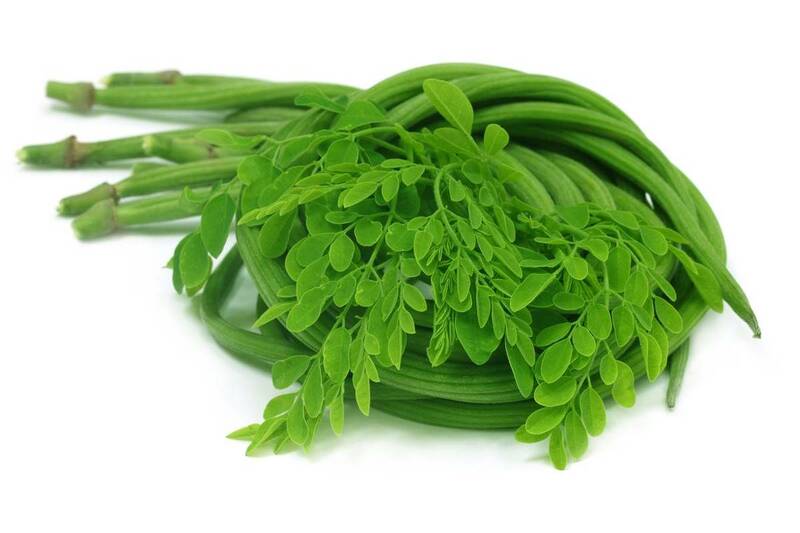 Improves heart health and reduces visceral fat: Moringaoleifera leaves serves as a safe and cheap source for the prevention of heart disease. The powder obtained from Moringa leaf extracts is beneficial in the upkeep of your heart health, especially when it comes to controlling the levels of blood cholesterol, blood pressure and prevention of formation of plaques in the artery. Daily supplementation of Moringaoleifera leaves extract can reverse the formation of fatty liver and therefore helps reduce visceral fat. Is a good source of calcium: 100 g of moringa leaves has 314 mg of calcium which makes it good for bone health and hence also beneficial for people suffering from osteoporosis. Offers anti-cancer properties: The moringa plant has antioxidant and radical scavenging properties which offer potent anti-tumor benefits as well as enhances the sensitivity of tumor cells to chemotherapy. It works by halting the division of cancer cells and inducing cell death. * Shade dry the leaves to preserve the nutrients and then powder it. Store the powder in an air dry container and add it to food or vegetable juices.